I am never sure where to add news about new books but as this is a WW2 title this seemed the best place! 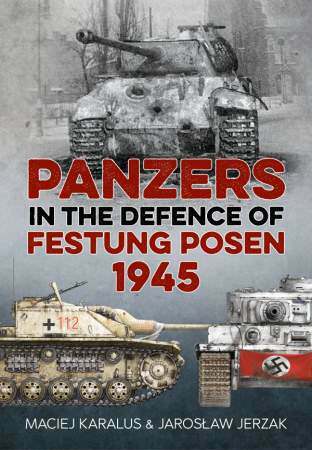 Its called "Panzers in the Defense of Festung Posen 1945"
and its advertised at http://theminiaturespage.com/news/?id=805157997 from where this book cover image was taken (below). "Paperback, 297mm x 210mm, 96 pages, 16 color photos, 61 black-and-white photos, 11 black-and-white maps, 8 tables"
Published by Helion who are currently offering it for £17.96p (plus P&P I presume) their usual price is £19.95p. I spoke to the lads from Helion at Border Reiver, (they had a stall there), but had sold out of a few books by the time I got there, this being one of them. I did buy some other books from them, and they said they had plans to do a few more 'land warfare' based titles...if the authors they use can get enough info to write some decent books.